I’m pretty sure at this point that my list was over-ambitious. It took me a really long time to fall asleep last night, and I didn’t sleep well. It was one of those nights where I was aware of trying to sleep (or being asleep) for most of the night. I was too excited about doing moar stuff!!! To top it off, I got up early. Blargh. I did do most of the laundry, which helped a bit with the mess in the bedroom, and I managed to tidy up the bathrooms too. I spent the rest of today trying, rather unsuccessfully, to nap. Everything else was just icing, but dammit, I like icing. Ah well. How about some knitting then? 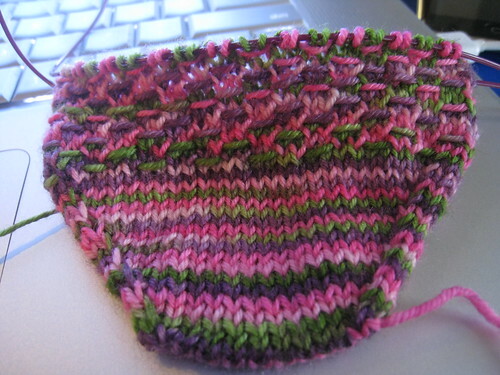 I love this colorway from the Yarn Pirate, but when I got it up to the right number of stitches for my toe, it became kind of muddied. See how pretty it is right in the first 3/4″ of the toe? I wanted my whole sock to look like that. Hence the slip stitch pattern. It helps, but not as much as I would’ve liked. Catkin is coming along too, but since it requires all of the concentration forever, I haven’t really worked on it in a couple of days. Furthermore, it looks all bunched up and lumpy there because, clearly, my needle is too short. You’ll have to wait for the finished product to see it in all of its orange and turquoise glory. Yes, I did just say orange and turquoise glory. IT WILL BE GLORIOUS I TELL YOU! Nice stuff and awesome cleaning energy! Makes me want to clean my fridge. It’s starting to get scary. Did I tell you the girls were all talking about their knitting Sunday. So, if I don’t see you before, can you come again on the 18th? :-) Thanks for doin such a great job on the teaching! Oh, and I dig your new banner! Anything you get done is great– don’t knock yourself out so you’re useless the next day and the day after that, even if you’re feeling like ARGH, MUST FINISH LIST. Take care, and remember– you can always do more later on. There will be tomorrows, and days after that. You’ve got to remember your spoons. Oooh…I can see why you like that Yarn Pirate color way. Very pretty. 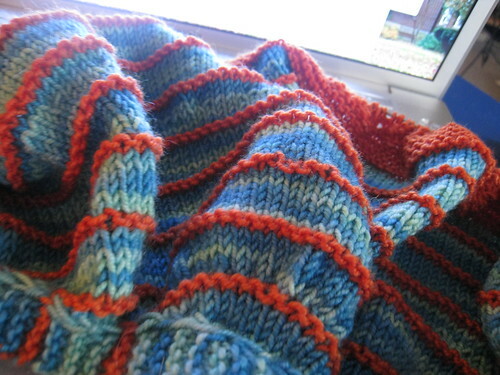 Have you tried any other slip stitch patterns to see if you can get the effect you’re after?